Who doesn’t love freebies? And who doesn’t love getting freebies that are expensive and that you actually like? My last foray into cold cuts at my breakfast in Sofitel and besides my usual parma ham favorite, I did really end up liking the salami. The fatty salty salami. Well, I did like all of them, but hey, I still have my favorites. 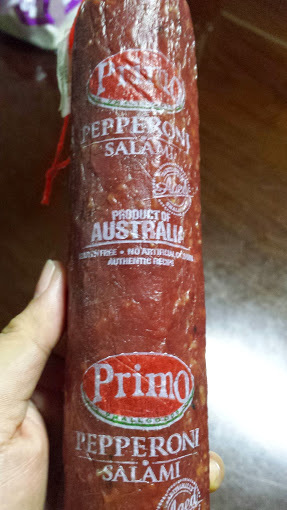 Upon opening the fridge one time, I was surprised to see a whole length of a Primo Pepperoni. I didn’t buy it and the only other person I know ridiculous enough to buy something like this is my older sister. But! She apparently didn’t buy it and got it for free from Gaisano Supermarket in Alabang. (Yay, thank you!) With no one willing to use it, I just ended up opening it and slicing myself some pieces to enjoy, as is. The spice in each slice was heaven. I don’t understand why some people want to cook this and remove all the fatty goodness when it is good as it is. Hmmm. Just writing about it is making me crave it more.